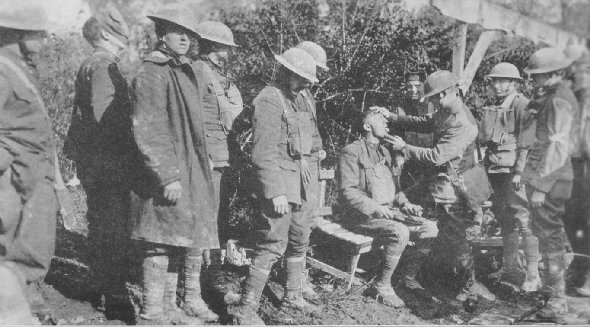 Lt. A. McLeod, M. C., examining gas patients of the 11th Inf., 5th Div., Madeleine Farm, Nantillois, France. During the whole of October, 1918, these men were almost continually engaged in some of the fiercest fighting of the war. In the Argonne, it was a serious problem for the food supply to keep up with the advancing lines. 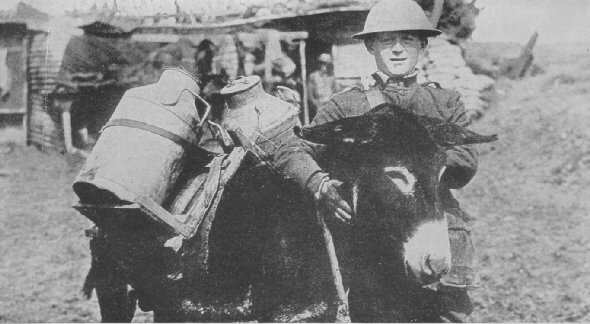 This member of the 132nd Infantry, 33rd Division, with the aid of a pack donkey, is bringing up food and water for his comrades.